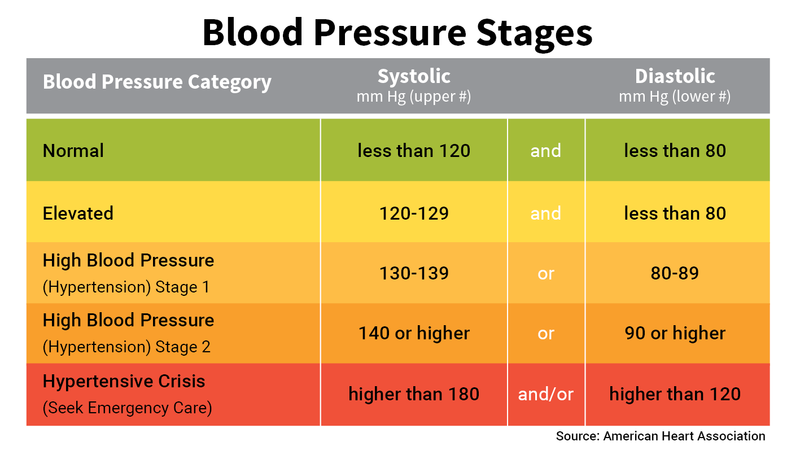 What Does the Systolic Blood Pressure Number Mean? What Does the Diastolic Blood Pressure Number Mean? How Often Should I Get My Blood Pressure Checked? Can I Check my Blood Pressure at Home? Do you often wonder what your blood pressure numbers mean? Doctors call them systolic (the top number) and diastolic (the bottom number) blood pressure. Knowing both is important and could save your life. When your heart beats, it squeezes and pushes blood through your arteries to the rest of your body. This force creates pressure on those blood vessels, and that's your systolic blood pressure. A normal systolic pressure is below 120. A reading of 120-129 is elevated. 130-139 is stage 1 high blood pressure (also called hypertension). 140 or more is stage 2 hypertension. 180 or more is a hypertensive crisis. Call 911. The diastolic reading, or the bottom number, is the pressure in the arteries when the heart rests between beats. This is the time when the heart fills with blood and gets oxygen. A normal diastolic blood pressure is lower than 80. But even if your diastolic number is lower than 80, you can have elevated blood pressure if the systolic reading is 120-129. 80-89 is stage 1 hypertension. 90 or more is stage 2 hypertension. 120 or more is a hypertensive crisis. Call 911. Our charts below have more details. A doctor or nurse will measure your blood pressure with a small gauge attached to an inflatable cuff. It's simple and painless. The person taking your blood pressure wraps the cuff around your upper arm. Some cuffs go around the forearm or wrist, but often they aren't as accurate. Your doctor or nurse will use a stethoscope to listen to the blood moving through your artery. In a blood pressure reading, the systolic number always comes first, and then the diastolic number. For example, your numbers may be "120 over 80" or written as 120/80. If your blood pressure is normal (less than 120/80), get it checked every year or more frequently as your doctor suggests. If your blood pressure is elevated -- systolic blood pressure between 120 and 129 or diastolic blood pressure of less than 80 -- your doctor will probably want to check it every 3-6 months. He'll probably recommend lifestyle changes like more exercise and a better diet. If you have stage 1 hypertension -- 130-139 over 89-90 -- the doctor might suggest lifestyle changes and see you again in 3-6 months. Or he could tell you to make the changes and give you medication, then recheck your condition in a month. It depends on what other health conditions or risk factors you have. Someone with stage 2 hypertension -- 140/90 or higher -- will likely get medication. You'll also be asked to make lifestyle changes and see the doctor again in a month. Keeping track of blood pressure at home is important for many people, especially if you have high blood pressure. This helps you and your doctor find out if your treatment is working. Your doctor may also suggest that you check your pressure at home if she thinks you may have "white coat hypertension." It's a real condition. The stress of being in a doctor's office raises your blood pressure, but when you're home, it's normal. Ask your doctor to recommend an easy-to-use home blood pressure monitor. Make sure the cuff fits properly. If your arm is too big for the cuff, the reading may be higher than your blood pressure really is. Ask your doctor for a larger cuff or make sure you buy a home monitor with a cuff that fits you. You also can use a wrist blood pressure monitor, but they often aren't as accurate. Follow the directions that come with the device to make sure you are using it correctly. No matter which type of blood pressure monitor you have, it's a good idea to take it to your doctor's office. You can compare its reading to the numbers your doctor gets. Avoid caffeine, cigarettes, and exercise for at least 30 minutes before the test. When you take your blood pressure at home, sit up straight in a chair and put both feet on the floor. Ask your doctor or nurse to show you the right way to position your arm so you get accurate readings. Check it at the same time of day so the readings are consistent. Then, take several readings about 1 minute apart. Be sure to write down the results. Take the blood pressure journal to your doctor's office so you can talk about any changes in your numbers. Your doctor will decide whether you need medications. American Heart Association: "Understanding Blood Pressure Readings," "What is High Blood Pressure?" AHA HeartHub for Patients: "High Blood Pressure." JAMA: "The Seventh Report of the Joint National Committee on Prevention, Detection, Evaluation, and Treatment of High Blood Pressure." American College of Cardiology: "2017 Guideline for the Prevention, Detection, Evaluation, and Management of High Blood Pressure in Adults."